The caboose, usually at the end of a train, although it could be anywhere, served as a freight train's office. The locomotive had the engineer, who was the train's driver, and a fireman whose job was to keep a fire on the engine to keep the water hot to keep it running. After the change from steam to either Diesel or electric engines, the task of the fireman was changed to serve as the engineer's assistant. The caboose served chiefly as the conductor's office. It was also where brakemen and trainmen (they moved switches) stayed en route. With more efficient brakes and computerized rails, the only person needed in the caboose was the conductor, who would usually stay aboard (there was a bed in the caboose) for the entire journey, even if it lasted for days. In the mid 1980s it was decided that a freight train could have all its operations confined to the locomotive. The caboose was considered not necessary. The jobs of fireman and conductor were combined: in essence, the fireman was dropped and the conductor was moved from the caboose to the locomotive. The days of huge freight train crews are long gone. Today the engineer and the conductor are the only ones aboard. And they only work for a portion of the routes (this has always been true with engineers and firemen). 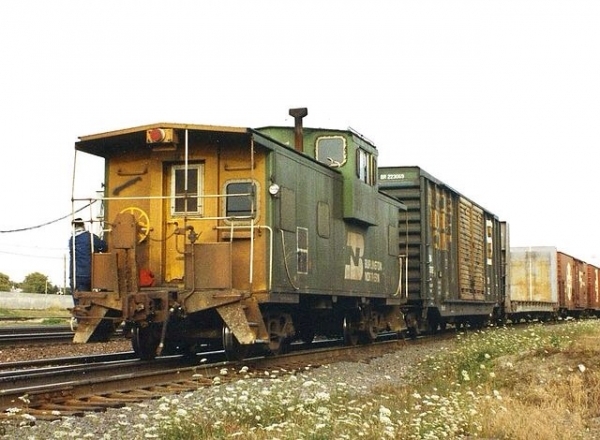 This is one of the last working cabooses, Burlington Northern from 1993. Expensive and unnecessary. Cabooses were abandoned in most European countries long ago. It was my understanding that the caboose was abondoned because of financial reasons?? Actually, Bob, you can thank LoyalTubist for this one. Wow, I just got an education from reading this. All I ever knew from a kid up to now was that the caboose was always the last car. Never questioned why.